The striped dolphin (Stenella coeruleoalba) has a slender body with a long dark beak. It's narrow forehead and melon are smoothly sloping and there is a distinct crease separating the forehead from the beak. It is boldly patterned in bluish grey and white, although under certain light conditions it may appear brown and white. A lateral stripe and spinal blaze are characteristic and distinguish the striped dolphin from other white-bellied oceanic dolphin. However, these markings may vary significantly between individuals and even geographically. There are one or two dark bands between the flipper and the eye, and a dark streak behind the eye (which often has a black patch around it). The sides of this dolphin are pale grey, as are the tail flukes. The dorsal fin is falcate and the flippers are small and slender with pointed tips. Striped dolphins are fast swimmers (travelling up to 15 km hour). When travelling at speed, up to a third of the members of a school will be above the surface at any one time. The species is highly active, breaching to heights of 7 metres above the surface, and is capable of amazing acrobatics including somersaults, tail spins and backward flips. Two main patterns of surfacing can be observed when swimming. The first involves dolphins rolling at the surface, emerging rostrum first and re-entering the water with the tail stock in a flexed position (as the last bit of the body to submerge). The second involves animals re-entering the water with the tail extended (the fluke disappearing last), which tends to occur at higher swimming velocities. Leaping is frequently observed whilst swimming at speed; the dolphins often breathing as they leap. Dives usually last from 5 to 10 minutes, and striped dolphins may dive to depths of 200+ metres when feeding. 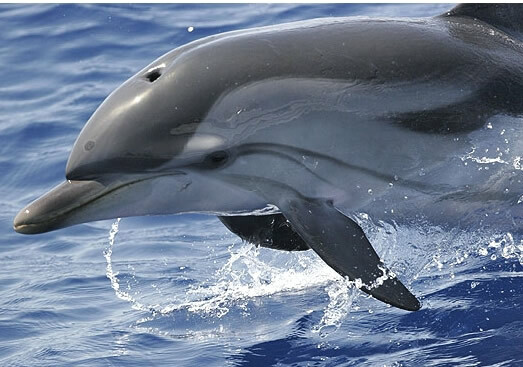 The striped dolphin is an oceanic species, only found close to shore only in places where the water is deep. It is mainly found in warm waters, although its range may extend into warmer temperate seas, tending to favour waters with large seasonal changes in surface temperature and thermocline depth with seasonal upwellings. In the North Atlantic, striped dolphins are typically found in water depths of 1,000 metres or more beyond the continental slope, but the species has been recorded in shallower waters around the Scottish mainland and west of the Faroe Islands. In other parts of the world, it ranges from southern Africa, southern India and New Zealand, to the South and North-west Pacific, central north America (on both east and west coasts), central eastern South America, the Azores, Spain, Portugal and the eastern Atlantic. Records range from the Bering Sea to southern California, and the species is also common in Japanese waters. No well-defined migration patterns have been documented for striped dolphins to date, but in some regions this dolphin can be encountered in all seasons, whilst in other areas it appears to be associated with the fronts of warm oceanic currents which move seasonally and result in sporadic warm water intrusions. Mature striped dolphins may range in length from 180 to 256 cm and 110 to 160 kg in weight. Average length at sexual maturity has been found to be 195 to 220 cm for both males and females at an age of 9 to 10 years. Breeding is seasonal, with calving peaks in summer and winter, and gestation lasts approximately 12 months. The estimated length of lactation is 15 months, but this may be between 8 and 20 months according to population density (in response to fishing pressure, for example). Striped dolphins feed mainly on small, mid-water fish and squid. In the Mediterranean, investigations of stranded animals have found that cephalopods dominate the stomach contents. Off Japan and South Africa, myctophid fishes predominate. Prey may range in size from 60 to 300 mm and include a wide range of species including some crustaceans such as shrimp. In captivity, the mean feeding rate of a striped dolphin is 3.45 kg of fish a day. These dolphins may dive up to 200 metres when foraging. In the eastern tropical Pacific, they are occasionally found with yellow fin tuna in possible foraging aggregations. Schools of striped dolphin may vary in both size and composition. Examination of school structure off Japan (where whole schools captured in hunting operations have been studied) has shown that most schools contain less than 500 individuals, although schools of several thousand may also occur. In the eastern North Atlantic, schools commonly comprise between 10 and 30 individuals and rarely reach the hundreds. In the western North Pacific, three types of schools have been identified: juvenile, adult and mixed. Adult and mixed schools are divided further into breeding and non-breeding schools. Calves remain in adult schools until 1 to 2 years old. After weaning, they then leave to join juvenile schools which migrate closer to the coast than adult and mixed schools. Most sub-adult females rejoin non-breeding adult schools, but some join breeding schools directly. Males rejoin adult schools after reaching sexual maturity, about equal numbers joining breeding and non-breeding schools. Breeding schools may contain sub-schools of fully adult females and socially adult males (which may leave the school after most of the females have been mated with). The breeding school thus evolves into a non-breeding adult school and, after the birth of the calves, a mixed non-breeding school. The breeding system is most likely to be promiscuous, although some degree of polyandry (where a female may reproduce only with several specific males) is thought to occur.